Winning victories in northern cities in the 1940s and 1950s, CORE became active in the South with the lunch counter sit-ins of 1960. The following year CORE organized "Freedom Rides," sending black and white students south to disrupt segregated interstate bus service. Drawing much of its membership from college campuses, CORE kept up civil disobedience campaigns in the North as well as the South. They also organized activities in California, where they protested housing discrimination in San Francisco and Los Angeles, held a Western Region Conference in the Sacramento area, and launched an equal employment campaign at restaurants and stores throughout the state. In 1968, Seattle's chapter of CORE decided that, in order for it to function best in the community, it needed to be an all-black organization. CORE has an African branch based in Uganda, with Fiona Kobusingye as is its director. Bringing attention to the malaria crisis is one of the organization's main activities, and it has championed the use of DDT to fight the disease, and it has partnered with a variety of conservative and libertarian think tanks in this effort. In 2007, CORE organized a 300-mile walk across Uganda to promote DDT-based interventions against malaria. According to an interview given by James Farmer in 1993, "CORE has no functioning chapters; it holds no conventions, no elections, no meetings, sets no policies, has no social programs and does no fund-raising. In my opinion, CORE is fraudulent." CORE has been criticized for its efforts promoting DDT use against malaria in Africa by environmentalist groups. An article in Mother Jones magazine accused the group of selling influence, writing that, "is better known among real civil rights groups for renting out its historic name to any corporation in need of a black front person. The group has taken money from the payday-lending industry, chemical giant (and original DDT manufacturer) Monsanto, and a reported $40,000 from ExxonMobil." In his book, Not A Conspiracy Theory: How Business Propaganda Hijacks Democracy, Donald Gutstein wrote that "In recent years CORE used its African-American facade to work with conservative groups to attack organizations like Greenpeace and undermine environmental regulation." Louisiana Diary, a 1964 documentary about CORE's 1963 voting registration drive in Louisiana. ^ "Charity Navigator - Unrated Profile for Congress of Racial Equality Inc". ^ "About Congress of Racial Equality | (702) 633-4464". Congress Of Racial Equality. Retrieved May 26, 2016. ^ August Meier & Elliot Rudwick (1975). CORE: A Study in the Civil Rights Movement. University of Illinois Press. ^ "This is CORE" (PDF). Archived from the original (PDF) on May 5, 2010. ^ Homes, George. "The Congress of Racial Equality"
^ David Hardiman (2003). Gandhi in His Time and Ours: The Global Legacy of His Ideas. C. Hurst & Co. Publishers. p. 256. ISBN 978-1-85065-712-5. ^ Meier and Rudwick, CORE, pp. 3–23. ^ Meyer and Rudwick, CORE, pp. 374–408. ^ Nishani,, Frazier, (2017). Harambee City : the Congress of Racial Equality in Cleveland and the rise of Black Power populism. Fayetteville: University of Arkansas Press. pp. 135–140. ISBN 9781610756013. OCLC 973832475. ^ Meier and Rudwick, CORE, pp. 33–39. ^ Nishani,, Frazier, (2017). Harambee City : the Congress of Racial Equality in Cleveland and the rise of Black Power populism. Fayetteville: University of Arkansas Press. pp. 43–45. ISBN 9781610756013. OCLC 973832475. ^ Meier and Rudwick, CORE, pp. 135–145. ^ CORE Rebuttal to CBS Standpoint editorial broadcast program, January 16, 1964, Chicago, CHM, CORE Papers, Box 2. ^ Greene, Christina (2005-01-01). Our separate ways : women and the Black freedom movement in Durham, North Carolina. University of North Carolina Press. ISBN 9780807856000. OCLC 65183735. ^ "Civil Rights March on Washington (History, Facts, Martin Luther King Jr.)". www.infoplease.com. Retrieved May 31, 2017. ^ Meier and Rudwick, CORE, pp. 269–281. ^ "Freedom Riders". Archived from the original on February 16, 2007. ^ "Congress of Racial Equality - Black History - HISTORY.com". HISTORY.com. Retrieved May 31, 2017. ^ James, Frank. "Martin Luther King Jr. in Chicago". Chicago Tribune. ^ "CICERO MARCH IS SELECTED FOR NATIONAL FILM REGISTRY – Chicago Film Archives". ^ "CORE Facts". Congress Of Racial Equality. Retrieved May 26, 2016. ^ Nishani,, Frazier, (2017). Harambee City : the Congress of Racial Equality in Cleveland and the rise of Black Power populism. Fayetteville: University of Arkansas Press. pp. 109–206. ISBN 9781610756013. OCLC 973832475. ^ Mitchell, Alison (September 13, 1993). "Mayoral Race Is Overshadowed In New York Primary Tomorrow – New York Times". The New York Times. Retrieved December 13, 2007. ^ Charles, Nick, "Equal Opportunity Scam", The Village Voice, April 22, 2003. ^ "Republicans: In Search of Enthusiasm". Time. May 17, 1968. Retrieved April 30, 2010. ^ "Immigration 101". Congress Of Racial Equality. Retrieved May 26, 2016. ^ "Core Africa – Defining Search Engine Optimization". ^ a b Gutstein, Donald (November 24, 2009). Not a Conspiracy Theory: How Business Propaganda Hijacks Democracy. Key Porter Books. ISBN 1554701910. Relevant section excerpted at: Gutstein, Donald (January 22, 2010). "Inside the DDT Propaganda Machine". The Tyee. Retrieved 22 January 2010. ^ Hilary Bainemigisha, "Uganda: Walking Kampala to Gulu to Fight Malaria" (Page 1 of 1). AllAfrica.com, July 10, 2007. ^ "Put a Tiger In Your Think Tank", Mother Jones, May/June 2005. ^ Mencimer, Stephanie Mencimer (November 10, 2009). "Tea Partiers' Next Target: The Climate Bill". Mother Jones. Retrieved November 10, 2009. Farmer, James (1985). Lay Bare the Heart: An Autobiography of the Civil Rights Movement. Arbor House. ISBN 9780877956242. 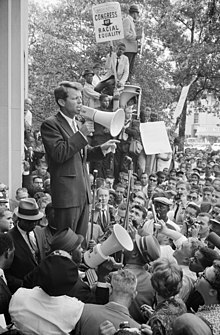 Wikimedia Commons has media related to Congress of Racial Equality. Congress of Racial Equality (CORE) Actions 1942-1970: Maps and charts showing the geography of CORE activism. From the Mapping American Social Movements project at the University of Washington. Timeline of Congress of Racial Equality Actions 1942-1970: A timeline of more than 600 events reported in CORE publications and The New York Times. "You Don't Have to Ride Jim Crow!" Web site for documentary of Journey of Reconciliation. The Frank J. Miranda Papers document Miranda's activities as CORE activist and one-time chair of the Boston CORE chapter. Located in the Archives and Special Collections of the Northeastern University Libraries in Boston, MA. CORE and Central Area Civil Rights Campaigns 1960-1968 , multimedia resources on CORE activity in Seattle, Washington from the Seattle Civil Rights and Labor History Project. CORE Documents Online collection of original CORE documents ~ Civil Rights Movement Veterans. Congress of Racial Equality, Seattle Chapter, records. 1961-1970. 5 cubic feet (12 boxes). At the Labor Archives of Washington State, University of Washington Libraries Special Collections.